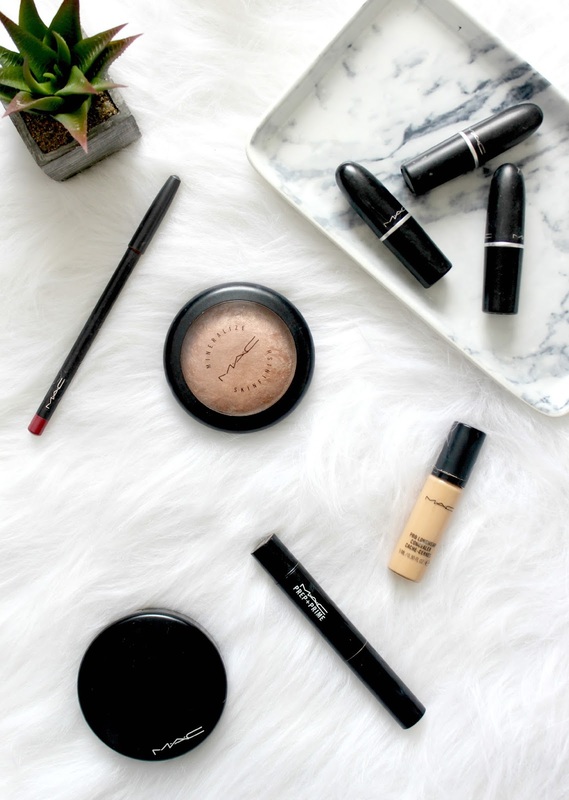 It occurred to me the other day that I've never actually shared my favourite MAC products here on my blog. 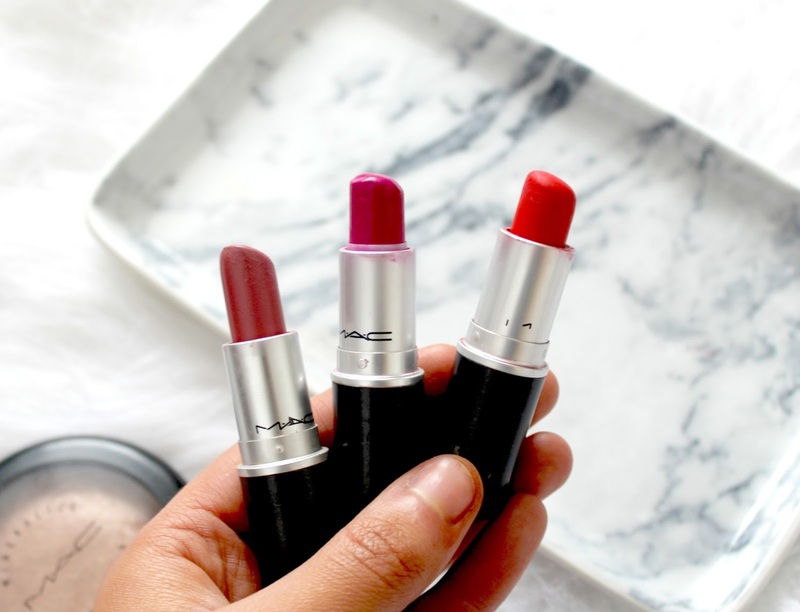 I've reviewed endless amounts of MAC lipsticks and done the odd MAC haul here and there but have never once talked about my go-to MAC products, the ones I always go back to and the ones I'll always repurchase! With that being said, I thought it was about time to pull my finger out and show you my MAC faves. I think I've tried almost every kind of product MAC has to offer from pigments to blush, foundation and eyeliners and while I've been impressed by most of the products I've tried, the ones in this post are the ones that have really stood out to me, minus 'Smolder' eye shadow as I didn't have one at hand to photograph. I hope you enjoy reading a bit more about them and why they're my favourites! I don't think anyone favourite MAC products post would be complete without a few lipsticks, would it? MAC are famous for their fabulous range of lipsticks and rightly so too as they're amazing! I love their HUGE colour choice, their range of finishes and the packaging - its just so sleek. I have quite the collection (around 13 - and that's after getting rid of a good few) but my top three favourites would have to be Brave which is the perfect dusky pink day time shade, Girl About Town which is a vibrant berry pink and Lady Danger, a bright orange toned red. As you can probably see from the image above, I've worn these lipsticks a lot and they're my go-to's when choosing a lipstick for day or night. I could have probably included more of MAC's lipsticks in this post as there's so many I love but if you're thinking of buying one, be sure to make it one of these! Following on with lips, another big favourite of mine is 'Soar' lip liner and although I only bought this a few months ago, I've already worn it so much! I was inspired to buy this after people said this is what Kylie Jenner uses to achieve her famous pout. I'm not too bothered about making my lips look huge like Kylie's but I love that whole nineties inspired lip trend and she works it perfectly so I figured this would be worth a try. I'm so pleased I bought it as its the perfect every day muted pink shade and paired with 'Brave' lipstick it makes the most lovely natural yet glamourous looking lip. I like to wear this both day and night and since trying this I've bought another two of MAC's lip liners which I'll be blogging about very soon. If I had to pick only one powder to use for the rest of my life, it would be this one. I've never found a powder / setting product that even comes close to this and I really wouldn't be without it. As you can see from the photos, I'm completely out of it but I immediately made a repurchase as soon as I hit pan. This product is a complete miracle worker in my eye - it sets foundation beautifully, gives my skin an almost airbrushed finish and adds some warmth to my skin tone too. I use the shade Medium Plus and its perfect for warming my skin up just a touch without making it look organe or caked in makeup. I actually want to get myself a few more shades of this powder as I hear they're also very good to use as bronzer or under eye setting powders. If you haven't tried this yet and want to create a really flawless base, its a total must have! I bought this product towards the end of last year after being recommended it so many times on Twitter and I'm so glad I did as its my favourite concealer ever, hands down. I actually bought it years ago but got the wrong colour and ended up giving it to my boyfriends mum as I hated it on me. However, now I have the right colour (NC20 if you're wondering), I'm completely in love with it as an under eye concealer and highlighter. I've never used anything that covers dark circles and redness as well as this and because the shade I have is slightly lighter than my skin tone, it really brightens up my complexion too. Its definitely a full coverage concealer but I don't feel like its too heavy or cake at all - in fact, I can barely feel it on my skin when I'm wearing it. This is a must have for me! Another highlighting product I love from MAC is their Prep & Prime pen in the shade 'Light Boost' which is a yellow toned liquid. I absolutely love using this over the Pro Longwear concealer to really give me some light under my eyes and its also great to use down the centre of the nose, forehead, cupids bow and I even dab a bit on my chin. Its great for achieving that whole Kim K contoured and highlighted effect and I already know I'll be using this when it runs out as it brightens up my whole face without the need for much effort at all. I simply twist the product up, dab it on where I want it and blend it in - simples! This was one of the first products I ever tried from MAC as I remember watching back to back 'top 5 MAC products' videos on Youtube and this was mentioned in almost all of them. If you want a champagne highlighter with a beautiful metallic sheen and something that will make your skin glow, this is it. 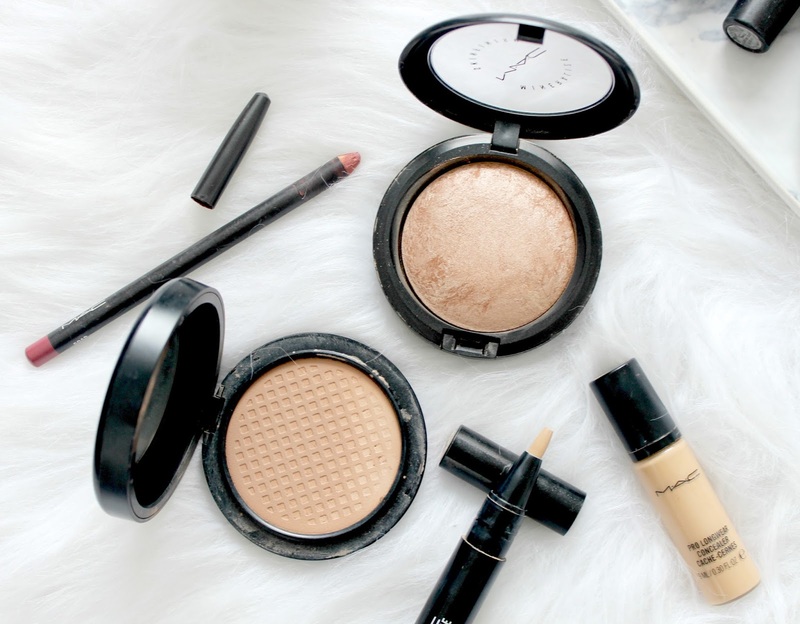 I've never found a highlighter I love more than this one and when dusted across the top of my cheekbones and down the centre of my nose, it makes me skin look so much more radiant than it does without it. I sometimes use it to highlight under my brow bone, the inner corner of my eyes or my collarbone / shins too. You can even use it as an eyeshadow so it really is a great multi-purpose product. I also love how long it lasts - even with daily use, it would take me a good twelve months to hit pan on one of these as you only need the tiniest amount with each use. What are your favourite MAC products? Is there anything I really need to try? i love the brave lipstick and soar lip liner! soft and gentle is also amazing, my fave lipstick is ruby woo which has amazing staying power! I adore the Pro-Longwear concealer! I love that concealer and lipstick so much, all their products are amazing! I really like their Pro Longwear Concealer as well. I have it in a slightly lighter shade so it brightens my under eye area perfectly. I am so desperate to try the mineralize skin finish, it looks so gorgeous and I've heard so much good stuff about it! I love Mac lipsticks - my faves are Heroine, Violetta and Creme Cup! I really want to try a Skin Finish! I ADORE girl about town. I love Mac Pro Longwear concealer. It has to be my all time favourite concealer, as it stays on all day and has great coverage with out looking cake. Does MAc products break you out? I love using the mineralised skin finish, it is so pretty! Love this! How great is the Pro Longwear Concealer and the Mineralize Skinfinish in Soft & Gentle, I also love the StudioFix Fluid foundation from MAC. Soft & Gentle is a product I've wanted to pick up for the longest time! It is so, so stunning. I have recently put my hands on Pro longwear concelear and I am in love. It brightens up eye area so good and stays pretty long on face. Can't wait to try more of their products! I love MAC cosmetics! Great post! MAC Lipstick in Brave is just stunning! :) I have to try this concealer! I need to get both mineralize skinfinishes. I have heard so much great stuff from both of them. I feel like I don't have much MAC products in my life! Their skin finishes & lipsticks for me are always my favourites. But then their foundations do come close! I love this post. I really want to try out the Mineralize Skinfinish and the Lady Danger lipstick. All of the face products are my favourite too! I rarely hear anybody talking about the prep+prime liquid highlighters, but I love them, I have light boost and another that's got more pink undertones (I forget the shade! ), they're really underrated.